Correctly setting of metadata is crucial from an SEO perspective. While many SEO parameters are simply visible for your users (like headings, URL's, links, etcera), metadata are a bit hidden under the hood of your site, only visible in the HTML code view. Metadata are actually meant to pass on information directly to search engines. When we talk about metadata for SEO, we mainly talk about the Page Title (this article) and Meta-descriptions. Some may say there's also Meta-keywords, but these are not used by search engines anymore. You may leave this field emprty, though it is still a part of Joomla. There are also some more advanced metadata, but these will be discussed in later chapters. I will first discuss the main purposes and requirements of proper page titles and then discuss how to set it up in Joomla. Note that if your set page title is irrelevant, Google will sometimes replace it with something more meaningful. 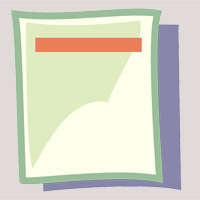 The page title is a heavy ranking-parameter for Google, so make sure you use your keywords wisely here. From a pure technical SEO perspective, there is hardly any difference, but if you see these 2 listed as the top 2, which one would you click if your kitchen is flooded? I have often seen Click Through Rates that improved 10-20% by simply rewriting a page title. Spending time on them is crucial, especially since user behaviour is nowadays used as a ranking signal (see this blogpost by MOZ). You see it gets broken off with .... Sometimes it's not that bad, but sometimes your keyword is hidden for users in Google. making sure the page title is below 60 characters usually keeps you safe. Note that on mobile, you may even have to go a bit shorter (50 or so). Note that this is no fixed requirement. Actually Google uses pixel-widths for this, and the character-count is just an avarage benchmark. 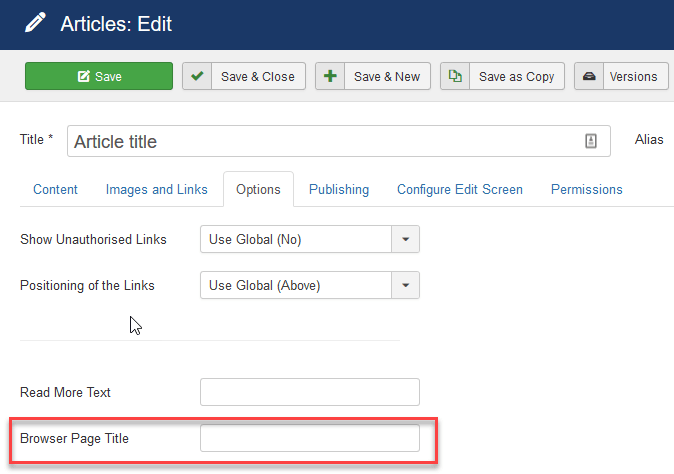 Without any further configuration, the page title is pulled from the title of the Joomla article for single articles (if shown in a blog) or the menu-title (if an article is attached to a menu-item as a single article: this difference is very important to note). As menu-item-titles are typically very short, this can have unwanted effects: as an example: it could result in a page title of just Home for the home page of your site. Imagine how that looks in Google...... Happily there are lots of ways to configure the page title. We will discuss these methods. If the site name contains your keyword, it could be wise to include it, but there are no hard rules which option is best, it really depends on your situation. So, image your Site Name is Some Brand Name and you set it to prepend, the page title for the Home menu-item now becomes Some Brand Name - Home. Still not perfect, but a lot better. The downside of using this option is that it is a global option for all pages. That is why in most cases, I leave it to No and fully manually build my page titles. Using this option, you have full control about your titles. It is a little more work, but the result could be very beneficial. On many sites, this is the best place to set a correct title. Again, taking the example of our homepage, if we change the browser page title to something like Quality SEO services, the page title now becomes Some Brand Name -Quality SEO services. Remember, the Site Name still gets appended. Now we finally have a perfect page title! 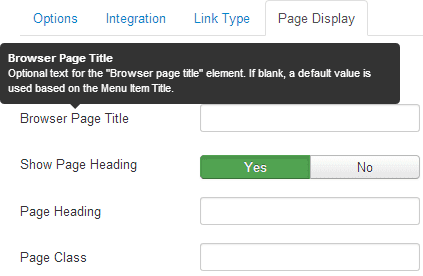 There are Joomla extensions that can help you to set up your titles. They offer features like dashboard-overviews of metadata, counters in the fields for page titles (and metadescriptions), etcetera. EFSEO: Finally, a really easy extension that works from the frontend of the site is Easy Frontend SEO. Nothing to explain, as it works so easy! Pro-tip: It is always wise to perform an SEO audit that also scans whether your page titles are indeed set-up correctly. I can highly recommend Ryte.com for this. It's free for one website (read my review of this service). For more sites, I personally also use Website Auditor by SEO Powersuite (desktop, free if you don not need to save projects).